Badlands sleeping bags are designed specifically for hunters and the unique demands they place on their equipment. The Cinder synthetic sleeping bag delivers comfort and performance under the most extreme conditions. 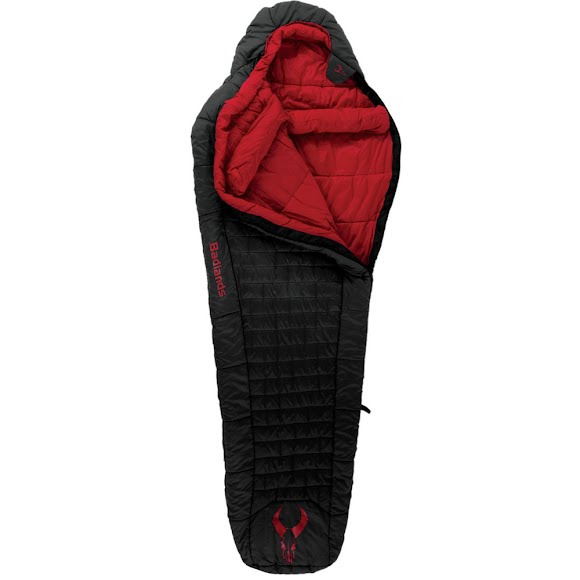 Utilizing the world's most advanced materials and manufacturing techniques, this sleeping bag has proven it is worthy to carry the legendary Badlands' Unconditional Lifetime Warranty. Badlands sleeping bags are designed specifically for hunters and the unique demands they place on their equipment. The Cinder synthetic sleeping bag delivers comfort and performance under the most extreme conditions. Utilizing the world&apos;s most advanced materials and manufacturing techniques, this sleeping bag has proven it is worthy to carry the legendary Badlands&apos; Unconditional Lifetime Warranty. It gives you one less thing to worry about while you get the best night&apos;s sleep of your life. Badlands TempraFill™ insulation is the world&apos;s most advanced blend of synthetic fibers and battings. Aside from being crazy comfortable, TempraFill is lightweight, waterproof, quick drying and designed to shield you from extreme elements. Length Regular: 80", Long: 86"
Shoulder Regular: 32", Long: 33"